The Award Winning FKT eVENT Soul Bivy is a lighter weight version of the time-tested eVENT Soul Bivy. The FKT eVENT Soul Bivy is about 3 oz | 85 gm lighter but maintains the same high-performance eVENT technology of superior breathability. The Award Winning FKT eVENT Soul Bivy is a lighter weight version of the time-tested eVENT Soul Bivy. The FKT eVENT Soul Bivy is about 1oz | 30gm lighter but maintains the same high-performance 3L eVENT technology of superior breathability. FKT, or “Fastest Known Time,” is literally the fastest time hikers, bikers, runners, and other endurance athletes have completed a certain trail or distance. The ethos behind FKT is self-reliance, and the FKT concept includes personal FKT’s – Your Own Personal Goal. To achieve a personal FKT gear is trimmed to the minimum and knowledge and training become key factors; movement is calculated to be as efficient as possible regardless of your overall speed or daily mileage. Whether you are racing, pushing your personal limits or just want to move through nature as efficiently and light as possible, the FKT eVENT Soul Bivy is designed to help you achieve those personal goals. 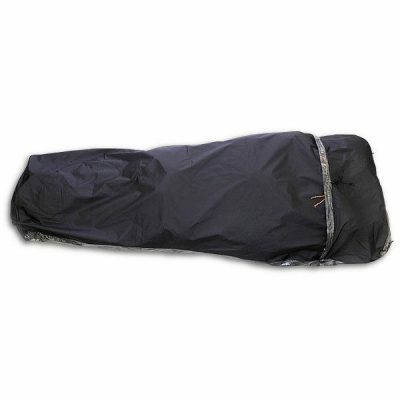 This ultralight bivy is also perfect for climbers and off road bike racers that need small packed size and light weight. The FKT eVENT Soul Bivy is made with the lightest 3-Layer eVENT fabric available. The bottom is a 1oz sq/yd DCF (Dyneema® Composite Fabric A.K.A. Cuben Fiber). The FKT bottom is slightly less durable than the heavier 1.5oz DCF on the regular Soul Bivy. To save weight, the FKT does not have the wire hoop of the regular Soul Bivy. Looking for something a little more durable? 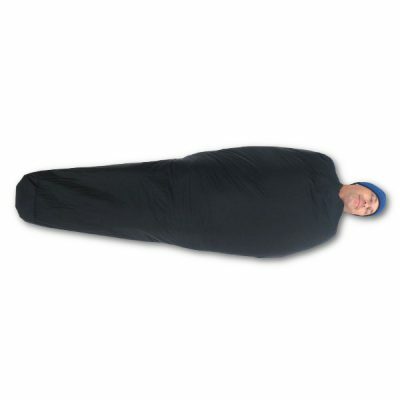 Try our eVENT Soul Bivy. 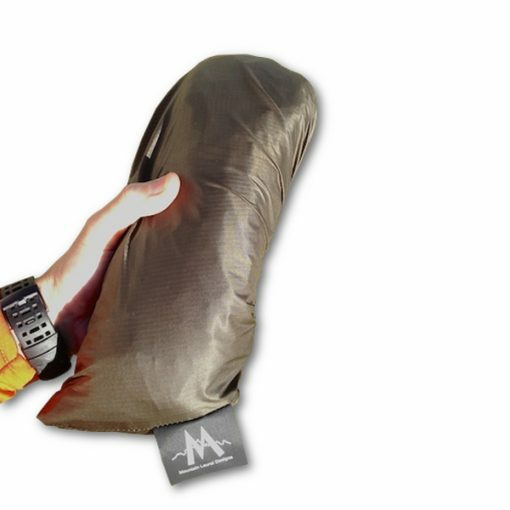 The FKT eVENT Soul Bivy, is a true Ultra Lightweight Specialists tool; please read the entire product description and specs before adding to cart. NOTE: The regular eVENT Soul Bivy features a wire hoop in the hood. The FKT version saves weight and does not have one. The FKT also uses a lighter weight DCF Floor. • 3-Layer eVENT 10d 30,000+ Breathability- The lightest 3-layer eVENT Made! • 1oz DCF (Dyneema® Composite Fabric A.K.A. 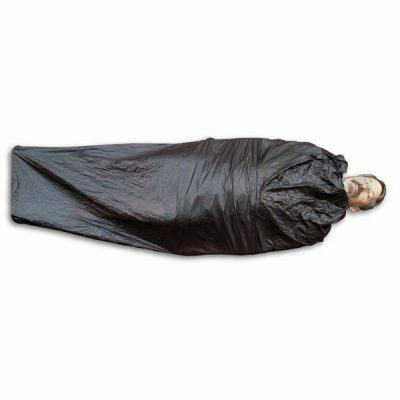 Cuben Fiber) Floor for Medium durability. NOTE: Requires user seam sealing! Check out the “Seam Sealing” tab for instructions. FITS USERS: Up to 6’2″ | 189 cm OR 185 lbs | 84 kg WITH a regular 20″ W x 72″ L pad, no thicker than 1.5 in. FITS USERS: Up to 6’6″ | 199 cm OR 230 lbs | 104 kg WITH a long (25″ W x 77″ L) pad, no thicker than 2.5 in. OR you move around a LOT or have mild claustrophobia. If in doubt on size, SIZE UP! Try out the fit at home for a few minutes after you receive your bivy. Make sure the test area is very clean – no dog hairs please. Lying on your back, a left zip bivy will have the zipper or your left, and a right zip bivy will have the zipper on your right. If you’re right handed, don’t assume you’ll want a right zip bivy – many right-handed hikers prefer left zip bivys because as you’re lying on your back, it’s easier to reach across your body to your left side to use the zipper. Of course, the opposite would be true for lefties. If you’re a side sleeper who sleeps primarily on one side, you may want the zipper in front of you so that you would choose that side for the zipper. 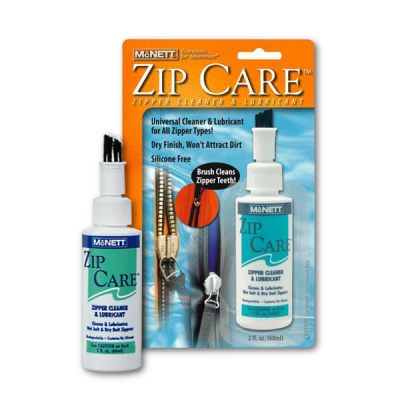 Each FKTeVent Soul Bivy comes with one tube of McNett Seam Grip Seam Sealer. It is STRONGLY recommended you use this supplied seam sealer to seal and strengthen the seams. 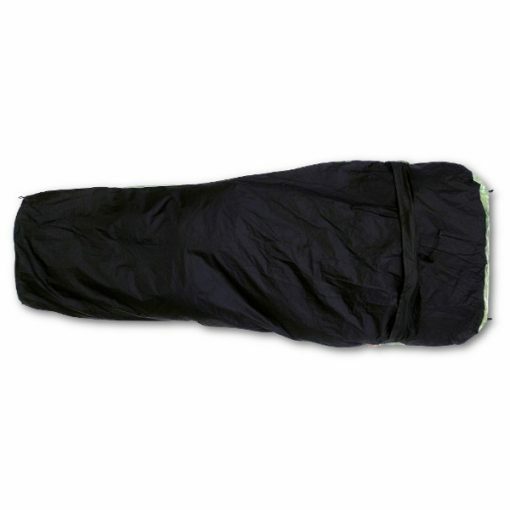 To do this, use towels, or some other soft stuffable cloth to fill out the inside of the bivy to press the seams out nearly flat. 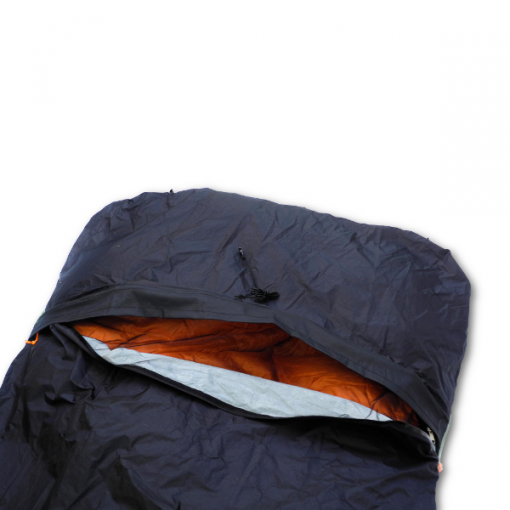 You are filling the inside of the bivy and sealing the outside seam. Stuff the bivy fairly tight, so all the seams are not kinked. Keep it stuffed tight as you are filling it. DO NOT stuff it half full and then start cramming it down—Too much pressure will stress the seams. Once it is stuffed, it is easy to apply a small bead of sealer on all seams. Then use your finger to gently press the small bead of sealer flat onto the seam. DO NOT go back and forth and back and forth with your finger to spread the sealer – it will start to gum up and look bad. Try to do it in one smooth pass of the finger. Hang the bivy and let dry overnight. A good seal seal job is key for long-term durability and waterproofness. The following video is of our eVent Rain Mitts being sealed, but the same technique applies. 1: Campsite location can make a huge difference. In bad weather, finding a semi-protected area under a rock overhang, behind a natural windbreak, the base of a large conifer tree or cave can offer a lot more livability. 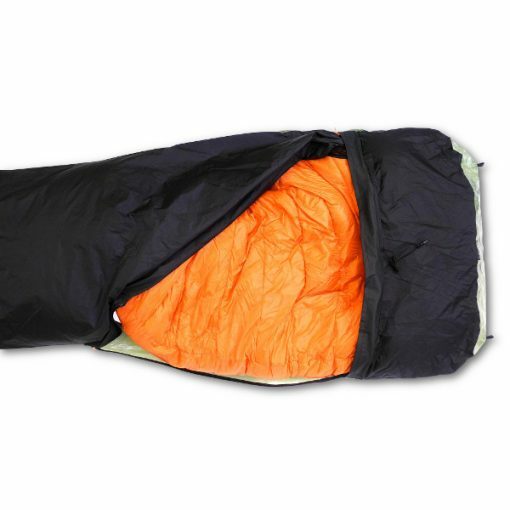 2: Using a synthetic sleep quilt offers a measure of comfort, warmth, and safety over a down bag in the event you have to enter and exit in rainy conditions or are forced to sleep in wet clothes. 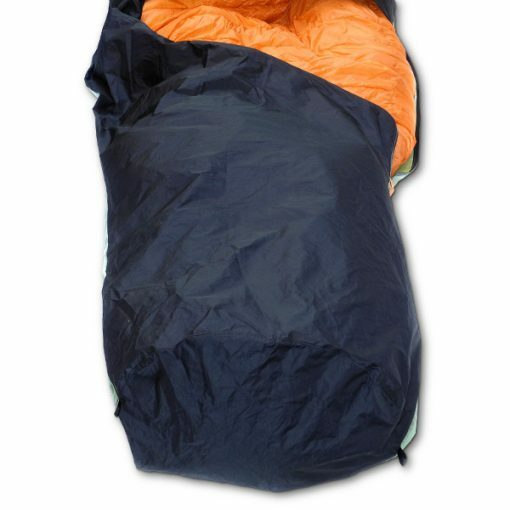 3: Use of a pack liner keeps your gear dry in the pack, and the wet outer pack body + other wet great can be stuffed into the liner for storage inside the bivy as a pillow if needed. 4: No bivy sack, even non-waterproof highly breathable DWR bivys, are 100% condensation free in all conditions. 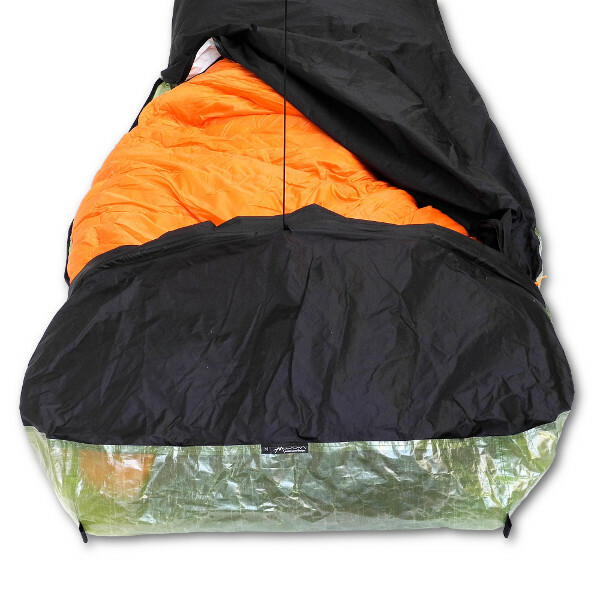 This bivy is one of the best, but taking preventative measures to limit condensation is key. 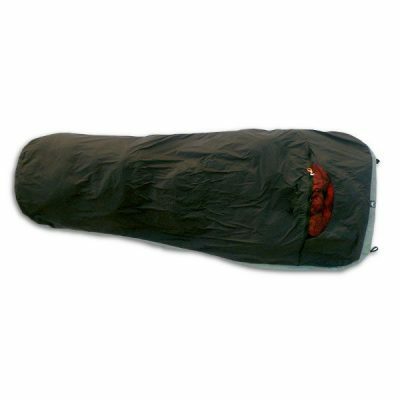 Campsite selection, venting and containing wet gear and clothing inside the bivy are imperative to lowering condensation. In challenging conditions, the overall goal is to be warm and being slightly damp and warm, is far better than wet and cold, or dry and cold. 5: If you expect lots of rain or very bad weather conditions, consider using a small tarp + the FKT bivy for those sleep periods. For some great use notes and more tips, visit the gear review at Backpacking Light. • The FKT eVENT Soul Bivy has all the same measurements as the eVENT Soul Bivy. • The FKT eVENT Soul Bivy uses a lighter DCF (Dyneema® Composite Fabric A.K.A. Cuben Fiber) (1.0 oz sq/yd vs. 1.4 oz sq/yd) and the FKT does not have a wire hoop. 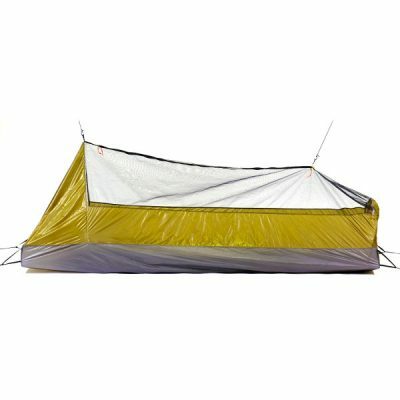 • The lighter FKT eVENT Soul Bivy is a little less durable then the eVENT Soul Bivy. • Breathability and functionality are about the same.